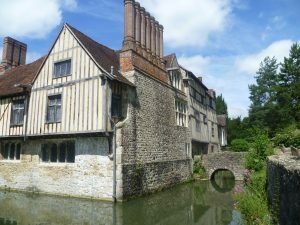 ‘Ightham Mote, wrote Nigel Nicolson (son of Vita Sackville West), is one of the oldest and loveliest medieval manor houses to survive in England. It has stood here for over 650 years, immune to fire, tempest, war and riot.’ And he’s right. It nestles in the Kentish Weald almost as if it’s grown organically. Even today, it’s not easy to find. Legend has it that, during the Civil War, Cromwellian soldiers arrived in the area intent on looting it, but got lost in the twisty country lanes, gave up, and ransacked somewhere else instead. 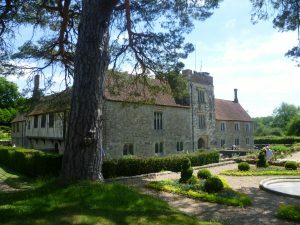 The photo above shows Ightham Mote (pronounced Item Moat) as the visitor coming down a steep wooded hill first sees it. It was never a grand house, and its owners, whilst important in their own neck of the woods, didn’t aspire to being players on the national stage. Sir Richard Clement was probably the most prominent, being a courtier to Henry VIII, who knighted him in 1529. These were dangerous times: Henry’s determination to divorce Katherine of Aragon was only a few years away. Sir Richard’s great hall has stained glass windows with both Henry and Katherine’s coats of arms to affirm his loyalty but he obviously took care to keep his head down at a time when he might easily have lost it. In essence, the house is a quadrangle round a central courtyard, surrounded by a deep moat which laps the walls on all four sides. Gradually, over six centuries, the various families who lived there altered the house to suit their own needs but always in sympathy with the original building. And, as you can see, it has a higgledy-piggledy charm all its own. Entering by the impressive gatehouse demonstrates the house’s importance to the world. The gatekeeper would want examine the visitor’s credentials and; if these were unsatisfactory, there is a dungeon underneath. The gatehouse, with its crenelated red-brick tower, has also been rebuilt over the centuries. The base of the tower dates from the 1330-40s; the sturdy, studded oak door dates from the 1550s, and the brick parapets were added in Elizabethan times. I especially love the courtyard which shows the quirkiness of the house. The huge kennel, dating from 1891, was built for Dido, a St Bernard. It’s the only dog-kennel in Britain which is a Grade 1 listed building. When I entered the courtyard, a small boy of just the right height was standing in the kennel’s doorway, hands on hips like a miniature Henry VII, looking as though he lived there. 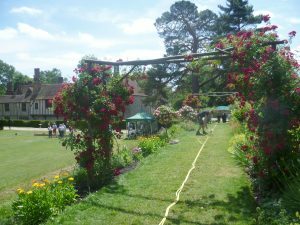 Outside, opposite the gatehouse, there is a stretch of lawn and, beyond that, a row of servants’ cottages, dating from about 1474. Nowadays, there are beds full of old-fashioned flowers against the walls on either side. 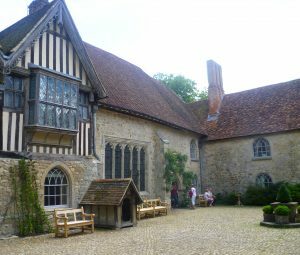 There’s something about the atmosphere of Ightham Mote, especially the exterior and the grounds, which is very soothing. Maybe it’s the scent of lavender and heritage roses, or perhaps it’s the water, I don’t know, but it is very special. 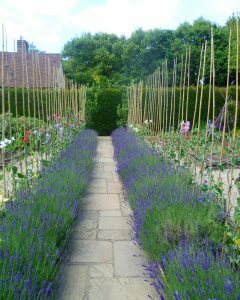 On the north side of the house, there is a bowling green, a walled garden, and, beyond that a wild garden, carefully cultivated to encourage bees – successfully, the air is full of humming. 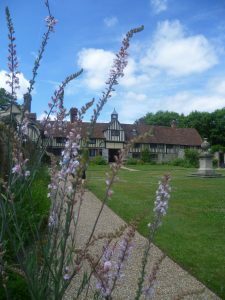 I imagine that the place probably gets very crowned at weekends, but it was mid-week, and not school holidays, so it was very pleasant to wander round and admire the gardens. There was also an excellent shop, and a café. If you wish to bring your own picnic, there is a grassy space designated. Unfortunately, I was not that impressed by the house’s interior; it was dark, rather poky and there was nothing much in it that one couldn’t see better examples of elsewhere. For me, it lacks a coherent story: for example, there’s a late 19th century bathroom next to the chapel; and the 1880s housekeeper’s room is next to the medieval great hall; the pleasing eccentricity of the house’s exterior has somehow dwindled into mere muddle indoors. We know that it was a much-loved home and it’s a pity that visitors cannot experience that for themselves. Having said that, the exterior of the house and grounds more than make up for any disappointment with the interior. I really loved it and, quite rightly, it gets a ***** rating on Google. I’m sure this was one of the places visited by the Bargain Hunt man in his little slot on interesting houses and museums. It rings bells with me. Looks charming and I’d love to see the interior because I’ll bet it’s very much what a lot of houses were like for our heroines (if not rich heroes!) who inhabited less grand dwellings. Poky rooms and higgledy-piggledy corridors is exactly what I imagine in some of my stories, so would LOVE to see this. I think it would be right up your street, Elizabeth. It was difficult to photograph the interior, though, my photos just came out too dark. The N.T. 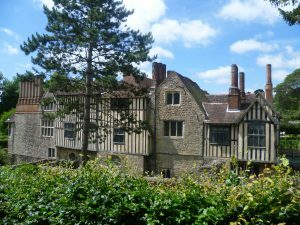 Ightham Mote website would probably have some better photos. 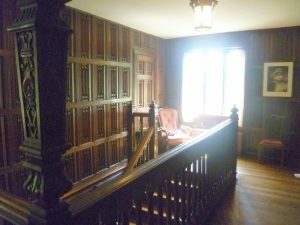 There are some bigger rooms, of course; there’s one with some very faded and rather stained Chinese wallpaper – you could see that once it was absolutely beautiful. This new craze for retaining everything as it was, is all very well but I was longing to see it as it was meant to look!